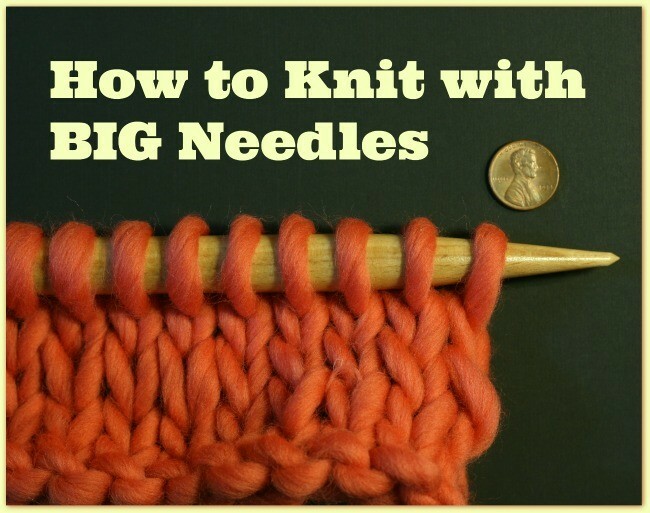 Sometime back, I found and read a very nice guide for how to knit with big needles. It was short but to the point and packed with plenty of helpful tips. When I dove into my big knit project this week, I went looking for that guide. I wanted to re-read it for myself and link it in my post. But I couldn’t find it anywhere and after hours of searching I gave up.. The internet swallowed it I suppose. Knitting on big needles is not exactly the same as knitting on normal size needles. There are many similarities of course. It is all knitting. But if you’ve ever picked up a pair of big, honking knit needles and started knitting you realized right away that it is not exactly the same as knitting on normal needles. It feels different. That’s because it is different. Of course. 1) Curl your pinky and ring fingers all the way under the needles. Your hands might do this automatically and that’s because the larger needles need to be supported more than their smaller brothers. But just curl. 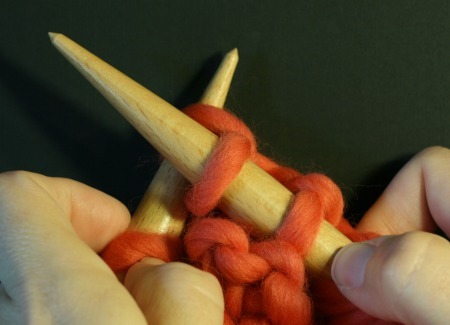 Don’t grip with those fingers and don’t try to use them to help make the knit/purl motions. You need to support your needles without getting in the way of stitches sliding around. 2) Work your newly made stitches all the way down past the neck of the needle. 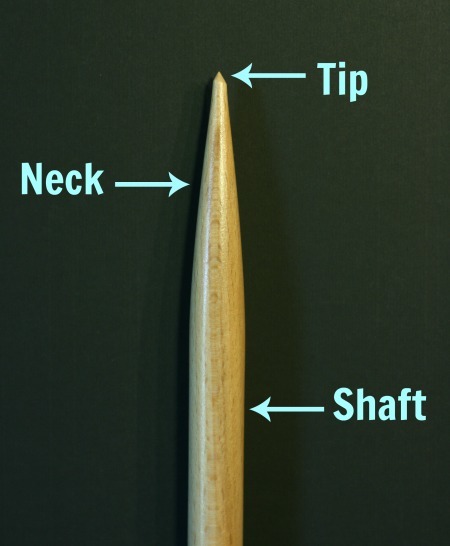 Needles are tapered of course and that taper is a lot more pronounced in a big needle. When you are knitting with a smaller needle, say a US size 8, then your taper begins at 0 (the tip) and increases to 5mm (the shaft). 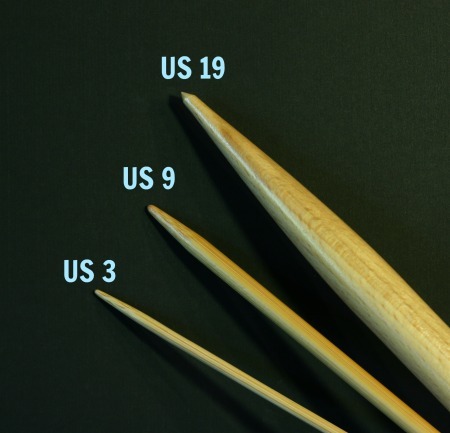 On a US size 19, your taper still begins at 0 but has to increase to 15mm. That is a much bigger increase. If you knit down near the tips, on the neck, you’ll be making stitches that aren’t big enough to slide along on the shaft of the needle. This style of knitting, on the neck, is not a big deal if you are working on US 8 because you made a stitch that’s 3mm (on the neck) and only have to force it up to 5mm on the shaft. But If you are working with US 19 and made a stitch that’s 8mm (on the neck) you’ll have to force it up to 15mm on the shaft. So finish every newly made stitch by pushing it all the way down off the neck of the right needle and onto the shaft. 3) Work a bit loose. Maybe you naturally knit loose. That’s good. That’s what you’ll need to work with big needles. Maybe you knit tight, in which case you’ll have to make a conscious effort to loosen up. On the smaller needles, you can get away with tightly made stitches that you push/pull around on the needles. With big needles, it gets harder. The diameter of your needles is so big and you have so much more surface area. The result is more friction between needles and yarn. If you knit tight you’ll have to really muscle those stitches around. So save yourself the effort and go loose. 4) Work slow. This can be a tough one to remember. But with big needles you’ll be making big movements. In fact all of your movements are exaggerated. Remind yourself to slow down. Big stitches take longer to make than small stitches. 5) Take frequent breaks. Not only do you need to stitch a bit slower than usual, you need to put it down more often and loosen your hands. Unless you do a lot of knitting on big needles, you’ll be straining muscles that don’t normally get used much so stop and stretch them out. Stop before your hands cramp. Here is a video for an older post (so you might have already see this one) to demonstrate how to work the kinks out of your hands. Feel free to use any of those exercises (I use the thumb one a lot) and toss in some wrist rotations. With big needles and big knitting your wrists are doing more work. So rotate them clockwise and then counterclockwise and keep them relaxed and loose. With these 5 tips you’ll be knitting big in no time. I do mean in no time. Big knits are fast knits, as I demonstrated in when I made a cowl in 90 minutes. With projects that finish so fast, big knits are worth the extra effort. And if this sounds just like a guide you read somewhere else send me the link? Please? Its still bugging me that I couldn’t find that article. We Are Knitters – a product review → ← Time to Knit! 8 Comments on "How to Knit With Big Needles"
Most welcome! I hope one or two of those excessive bring you some relief. And please remember not to stitch for too long at a stretch. With this medical conditions, you need breaks! I recommend drinking plenty of coffee. or tea. Or beer. Anything that will make you get up a lot and run to the Little Girl’s Room! I always wondered it knitting on bigger needles than my usual 2.0 – 2.5 mm sock needles would be easier on my arthritic hands and bone-spurry thumbs. Then I made a sweater using a bulky yarn and US10.5 needles, and it was even more painful. It was more like work than fun. I’ll bet your tips would have helped me, so I’m going to revisit this post if I ever knit “big” again. Thanks, Jenn. Breaks. Lots and lots of breaks for you my dear! And maybe all wooden needles all the time. many of my knitters with arthritis say that metal needles clicking together adds to the pain. Just a thought. Thank you so much for the wonderful tips. You confirmed what I have learned the hard way. Like Quinn I have bone spurs in my thumb joints giving me limited motion. I have learned work arounds for crochet but have real problems with large hooks and bulky yarn. When I started knitting I was advised to start with big needles and bulky yarn. Didn’t take but a couple of rows to change to a worsted and 6 needle. I have also found that knitting doesn’t bother my hands like crochet. Regardless I’ll not put down my hooks and needles. Big Crochet has plenty in common with Big Knits but… there is even more stress and strain put into the wrist. Best to keep the wrists loose and don’t over-work them. Take breaks, rest and and pet the fur-babies! Thank you for the tips on knitting with the big needles!! Once my kits arrive I will be digging right in and making an attempt with them!! Oh good! Hope your yarn and stuff comes in very soon. I want to hear how it goes!